The Ruffled Fan Palm originates from the Vanuata Islands, off the coast of Australia. Its Botanical Name is Licuala grandis, however its leaves are actually the smallest of its family or genus. 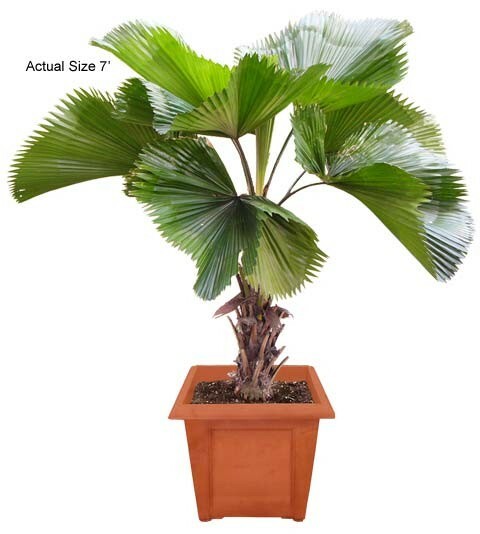 The Ruffled Fan Palm received its name from its green fan-like leaves that join to the tip of the leaf. These tips on the Ruffled Fan Palm appear as teeth and can be rather sharp, so avoid rubbing against its edge. 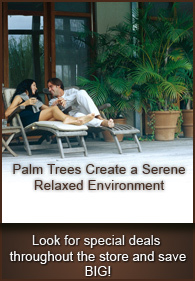 The Ruffled Fan palm usually grows to a height of 6 feet with some reaching a maximum of 10 feet. When mature, the Ruffled Fan Palm develops red marble-like seeds under its foliage. These bright red seeds give the Ruffled Fan Palm an amazing appearance and can bring in just the right touch of color to any garden or home. The Ruffled Fan Palm is a very exotic palm that provides the feeling of the tropics, without having to be in the tropics.